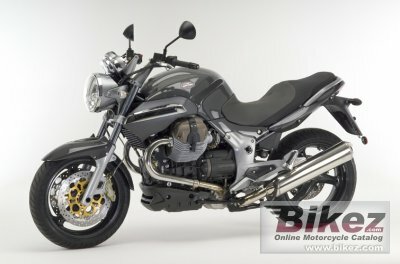 2009 Moto Guzzi Breva 1100. Picture credits - Moto Guzzi. Submit more pictures. When Carlo Guzzi established Moto Guzzi back in 1921, he was brimming with simple but effective ideas. The motorcycle was waiting for someone to drag it out of the pioneering age and transform it into a functional and universal means of transport. Guzzi therefore set about designing practical machines to match the needs of the masses. Exhaust system: Stainless steel, 2 in 1, with three ways catalyser and Lambda probe oxygen sensor. Euro 3. Rear suspension: Single arm suspension progressive linkage, rear shock absorber adjustable in rebound ad pre-load (hydraulic). Ask questions Join the 09 Moto Guzzi Breva 1100 discussion group or the general Moto Guzzi discussion group. Bikez.biz has an efficient motorcycle classifieds. Ads are free. Click here to sell a used 2009 Moto Guzzi Breva 1100 or advertise any other MC for sale. You can list all 2009 Moto Guzzi Breva 1100 available and also sign up for e-mail notification when such bikes are advertised in the future. Bikez has a high number of users looking for used bikes. Before you buy this bike, you should view the list of related motorbikes Compare technical specs. Look at photos. And check out the rating of the bike's engine performance, repair costs, etc.